“Childhood is a branch of cartography. 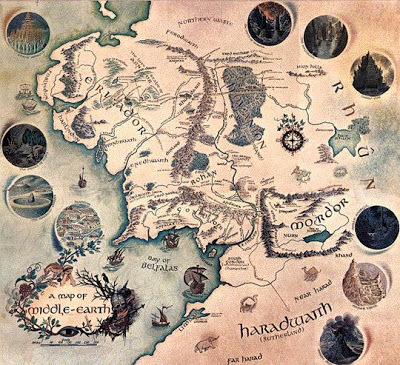 Most great stories of adventure, from The Hobbit to Seven Pillars of Wisdom, come furnished with a map. That’s because every story of adventure is in part the story of a landscape, of the interrelationship between human beings (or Hobbits, as the case may be) and topography. Every adventure story is conceivable only with reference to the particular set of geographical features that in each case sets the course, literally, of the tale. But I think there is another, deeper reason for the reliable presence of maps in the pages, or on the endpapers, of an adventure story, whether that story is imaginatively or factually true. We have this idea of armchair traveling, of the reader who seeks in the pages of a ripping yarn or a memoir of polar exploration the kind of heroism and danger, in unknown, half-legendary lands, that he or she could never hope to find in life. Thanks for highlighting this. I will check out the source article. And then when the kiddies get home, I may engage them in map-making. Would be interesting to see what they chart. We moved so often, I made maps probably out of some compulsion to control or better know the new place(s). The maps included things like the [secret] bridge I thought only I knew about, the farm with all the donkeys, the tree where I'd sit and read, etc. Maps really are such an integral aspect of our lives, even in ways we may not think of as map-making or cartography (I'm always thinking about this!) I think children understand this naturally – when we are young we're always comparing our place, dimension, and location in the world. There was a mind-blowing (for me) episode of This American Life about maps. Hopefully html works here but it's an episode from October '08 called Mapping. "…creating a map means ignoring everything in the world but one thing…that one thing could be a map of bus routes or air traffic control patterns, the homes of Hollywood stars, or it could be the cracks in the sidewalk. Maps have meaning because they filter out all the chaos in the world and focus obsessively on one item…"
Sorry for taking so long to moderate your comments–the notifications were going in the SPAM folder. Hi Sabra!